The Apple Developer Conference is coming up next week and there is a lot of speculation about what Apple will announce, especially in the area of hardware. Most likely there will be new iPad models and new laptops, but probably not the new iPhone model, which is said to be coming later this year. This is the 10th anniversary of the iPhone, which represented a radical re-invention of the mobile phone, soon followed by similar Android phones. I just published a piece in Language Learning & Technology on what the smartphone has meant for literacy training and language learning. The most successful mobile apps and services feature contextualized learning through an ecological approach. Apps can place language and culture learning into a localized setting, while also leveraging the resources of the global network. That makes available both social connectivity and worldwide information sources. In the process, learning content is customized and personalized, allowing the user to integrate new knowledge and skills into a real-world setting. This approach brings into play three major affordances of the mobile complex, which will be discussed here: situated learning, local and global integration, and personal empowerment. One of the most powerful affordances of smartphones is situated learning. Embedding activities and language in real-world environments holds the potential to make learning more meaningful and memorable. The built-in GPS, mapping, and touch control graphics of smartphones allow mobile apps and services to be location-aware and to provide continuous updates as a user moves from place to place. 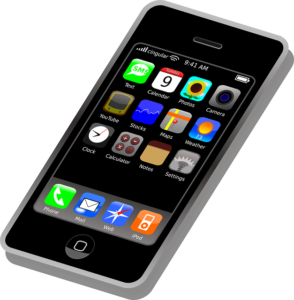 Smartphones are uniquely equipped to support localized use, while making available all the resources of a global network. One of the seemingly minor but, for linguistic purposes, highly useful innovations of the iPhone was the elimination of the physical keyboard, using instead an on-screen keyboard. While there were initial complaints over the difficulty of typing accurately with fingers, now that screen sizes have grown, and auto-correct algorithms have improved, users have gotten used to this form of text entry. The major benefit has been to make it much easier to support different writing systems. Having mobile devices support a local language makes them into powerful tools for teaching literacy. In many developing economies, where there is not a fully developed landline phone and Internet system, mobile phones provide voice telephony, text messaging, and Internet access. This is particularly the case in isolated and rural areas, where solar and other alternative power sources can be used. In such environments, or among scattered urban groups, there may be limited access to schools or libraries, so that mobile devices offer a unique opportunity for the delivery of education. Smartphone users, from virtually any connected location, have the power to connect interactively to a wide array of educational opportunities. This is an invaluable tool for enabling educational services in far-flung locations and supporting distance learning, but it also offers face-to-face instruction a means for students to learn on the go wherever they may be. Every smartphone is configured differently, customized as to language and locale, and loaded with apps of the user’s choosing. One of the difficulties in being able to measure the efficacy of MALL projects [mobile assisted language learning] is that the typical student will have access to and be using daily a variety of online tools and services. Some may be in the target language (foreign newspapers or TV stations) or be designed for language study, ranging from basic tools such as dual-language dictionaries to sophisticated services such as Babbel or Duolingo. The extent to which language learners take advantage of such resources will vary with the individual and the context of learning. While language learning may not be an issue of central importance in the lives of many of our students, learning a second language, along with the cultural framework that comes with it, is a matter of crucial importance to one population: migrants and refugees. For these groups, mobile phones are a powerful instrument in potentially life-changing (or life-threatening) situations. Smartphones do not seem likely to be going away anytime in the foreseeable future. While the pace of innovation has slowed, new features will continue to be added as the devices become thinner but more powerful. As inexpensive smartphone models proliferate, feature phones have been forced to add features formally found only on expensive smartphones. This should enable the spread of smartphone-like capabilities to more communities. This, in turn, will encourage further development of mobile-enabled literacy projects and language learning applications. Language learners will continue to use regular commercial apps for socially based or incidental language learning, while taking advantage of utility apps for translation and dictionary look-ups. While smartphones have clearly moved from the category of fun toys to that of powerful pocket computers, it is no easy task to harness the computing, communication, and collaboration capabilities for the purpose of serious learning. For instructed language learning, the mobile complex, developed around the smartphone, provides both challenges and opportunities. The main challenge is to provide to students the skills and knowledge to be informed and engaged online learners. Important in that process is presenting persuasive illustrations of learning connected to students’ lives (present and future) and to bring those experiences into the classroom. The most effective way to do that may be through the smartphone they likely all own. The opportunity is to leverage those digital devices and online experiences to enable and encourage in our students life-long learning, learner autonomy, and critical digital literacy.